Exhibiting at a convention can be an anxious task for first-time vendors. What's the best way to promote your brand? What type of image do you wish to project? These are tough questions without easy answers, but Displays2go can make the process a little less anxious! Budget friendly trade show booths offer convenience to new attendees who haven't exhibited before. We're talking one-stop-shopping here. Each all-in-one kit features an affordable, yet complete, solution that includes three to five distinct display fixtures. 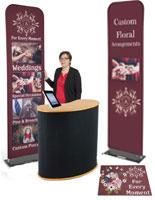 Our budget friendly trade show booths are all priced under a cost-conscious $1000. But, spending less doesn't mean you have to skimp on quality. 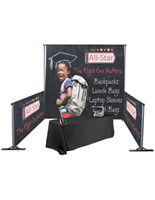 We offer a nice variety of trade show display fixtures, including custom-printed backdrops and banners! Build your brand while instilling confidence during your first convention experience. From here, the sky's the limit! What kinds of booth display solutions can I expect for under $1000? All our budget friendly trade show packages include a custom printed graphic in some form. This gives viewers a visual representation of your business. 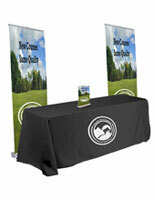 Retractable banner stands are free-standing displays that can be placed anywhere inside a booth. They are portable and easy to carry while the vinyl banner is safely stored inside the base. Conversely, you have the option of purchasing a fully printed backdrop. Located at the rear of your booth, large format graphics make quite an impression! Now that trade show attendees see what and who you are, how will you display and distribute company information? Literature holders perform the important task of organizing brochures, pamphlets, and/or catalogs. The stands also keep this information close by and within easy reach while you interact with potential customers. In keeping with the "portable" trade show booth idea, these literature holders also feature collapsible or knockdown designs. Perhaps the most important part of any booth setup is the main focus. For attendees, this is usually the salesperson manning the show. Tables and/or stand-behind counters help place the focus on the speaker. After all, it is their job to sell the product or service. These furnishings provide the best place to conduct one-on-one meetings, away from the hustle and bustle of the crowd. 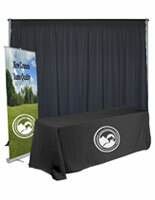 Table covers also dress up the occasion with a more formal, professional presentation. For vendors exhibiting on a smaller budget, less can be more. We suggest placing more emphasis on the quality of your displays and not the quantity. The last thing you want to do is distract potential clients. Trade show planning on a cost-conscious budget requires discipline. Keep your marketing strategy simple, your promoting angle organized, and don't forget to smile!